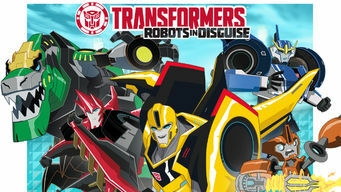 How to watch Transformers: Robots in Disguise: Season 3 (2016) on Netflix Brazil! The availability of Transformers: Robots in Disguise: Season 3 on Brazilian Netflix can be found in our listings below for each season. If the season/episode you want isn't available, you may be able to unlock it right now in Brazil and start watching! Change your Netflix country with a few simple steps and start watching. We'll keep checking Netflix Brazil for Transformers: Robots in Disguise: Season 3, and this page will be updated with any changes. When a prison ship crash unleashes hundreds of Decepticons on Earth, Bumblebee leads a new Autobot force to protect humankind. The planet has been peaceful with Decepticons out of the picture. But a new threat has arrived. Season 1 of Transformers: Robots in Disguise has 26 episodes. Because different Netflix countries have different availability for episodes, you'll need to check the episode listing below to see which are available in Brazil. A strange subspace message leads Bumblebee and a motley crew of Autobots back to Earth, which is about to be overrun with Decepticons. As metal-eating Decepticon Underbite demolishes Crown City, Bumblebee tries to get his team of Autobots to work together. Bumblebee's bunch of Autobots must learn how to work together as a team while doing battle with the Sharkticon Hammerstrike and wolflike Steeljaw. Fixit finally gets a chance to fight alongside the members of Bee Team, but finds he may not be as prepared as he thought. Human scientists discover evidence of the Decepticon presence, and Bumblebee struggles with his leadership role while his team battles Terrashock. While hunting for Thunderhoof, a Decepticon using humanity's folklore against itself, Bumblebee comes to question Sideswipe's allegiance. The Bee Team launches a rescue operation when Filch, a birdlike Decepticon with a love of shiny things, abducts Denny. When Grimlock starts behaving aggressively toward members of the Bee Team, they learn that a tiny Decepticon has taken over his mind and body. On her first solo mission, Strongarm pursues Springload, a deranged Amphiboid Decepticon, to the ruins of an ancient temple. While playing host to Autobot legend Jazz, Bumblebee's team faces Ped, an enormous Bot-worm determined to deplete the Energon supply. When a Decepticon toxin causes Bumblebee to regress to childhood, the Autobots must hunt a fugitive while baby-sitting their leader. Bumblebee's team is confronted by two rival bounty hunters, both of whom are out to claim the price on Bumblebee's head. As the Bee Team confronts the smelly Malodor and his Skunkticons, Optimus is put through a perilous test of his abilities in the realm of the Primes. Sideswipe blackmails Strongarm into staying behind while the Bee Team pursues crablike Decepticon Clampdown, who wants to join Steeljaw. Nightstrike, a batlike Decepticon, captures Denny and the Autobots, holding them captive and subjecting them to their worst fears. When Vertebreak captures Sideswipe and puts his head in a jar, he learns that he can still contribute to Bee Team. A feud with his sensei, Drift, prompts Jetstorm to return to Earth to continue his training with Russell as his new teacher. As Bumblebee's team confronts undersea Decepticon Octopunch, Grimlock hopes to keep a serious injury from threatening the mission. When Decepticons Groundpounder and Headlock scheme to enter a human demolition derby, Grimlock, Denny and Fixit go undercover to even the odds. The Autobots try to repair Fixit, but only end up turning him into a killing machine that mistakes the Bee Team for fugitive Decepticons. Bumblebee and his team must get back in to the Scrapyard, which Steeljaw's crew has overrun while they were away. Dinobot leader Grimlock faces a crisis of conscience when Scowl, a Dinobot with a mean streak, goes on a spree of destruction. When Zizza, a queen bee Decepticon with mind control powers, seizes an airport, Bumblebee's team joins forces with fellow Autobot Windblade. On a sightseeing visit to an Old West ghost town, the Bee team encounters Pseudo, a Decepticon with the power to change its shape. As Steeljaw plans to teleport Megatronus, the first Decepticon, to Earth, Optimus Prime prepares his own return to protect the planet. Bumblebee and his team reunite with Optimus Prime to prevent Megatronus from destroying both Earth and Cybertron. Season 2 of Transformers: Robots in Disguise has 13 episodes. Because different Netflix countries have different availability for episodes, you'll need to check the episode listing below to see which are available in Brazil. Bumblebee splits the Autobots in two: a "Home Team" to deal with local threats and an "Away Team" to search for fugitives around the world. Bumblebee's emotions cloud his judgment in a fight against the Decepticon Overload. Elsewhere, Optimus's waning strength gets his team in trouble. As the Autobots track the ore-scavenging Decepticon Saberhorn, Steeljaw learns of a community of Decepticons that are living on a crumbling starship. After a close call with the Decepticon Crazybolt, a dutiful Strongarm puts herself on administrative leave. But Crazybolt is still on the loose. After two Mini-Cons attack a weakened Optimus Prime, Windblade vows to protect him. But her valiant efforts only turn her into an easy target. Grimlock wants to get smarter as fast as he can. But an attempt to off-load data directly into his brain has unexpected consequences. A captured Steeljaw uses trickery to send the Autobots after a mystery Decepticon, and in their absence, he sets out to free some of his former pack. Bumblebee agrees to a well-deserved break. But a relaxing night out at a Rear Axle concert turns into a raging battle with fugitive Decepticons. The Autobots set out in search of Quillfire, but Grimlock can't join the mission unless he's got a good disguise. Can Fixit help him find one? While attempting to repair the GroundBridge, Fixit accidentally opens a portal that releases Soundwave and Laserbeak from the Shadowzone. While checking on one of Windblade's supply stashes, the Away Team is ambushed by a militaristic Decepticon named Stockade and his Mini-Con troops. As Steeljaw seizes control of Decepticon Island, the Autobots encounter a renegade Mini-Con who reveals the island's surprising history. As the Autobots fight to escape Steeljaw's clutches, Bumblebee's Decepticon hunter falls into Steeljaw's hands, making him even more powerful. Season 3 of Transformers: Robots in Disguise has 6 episodes. Because different Netflix countries have different availability for episodes, you'll need to check the episode listing below to see which are available in Brazil. Sideswipe gets a history lesson when the Bee Team finds a Decepticon and his Mini-Con scavenging for artifacts in the Autobots' first base on Earth. After bungling a test devised by Fixit, Strongarm vows to prove herself in a fight against a scavenging Decepticon and its Mini-Con partner. After learning patience from a pretzel-making monk in an Alpine monastery, Grimlock applies his knowledge in a fight for a powerful relic. Flanked by bounty hunters, a power-hungry Starscream comes to Earth in search of the Decepticons' Mini-Cons, taking Bumblebee hostage in the process. The Autobots join the Mini-Cons to battle Starscream in an attempt to win Bumblebee back. But will Starscream manage to pry power from the Mini-Cons? With Starscream on the brink of unbridled power, Optimus Prime and the Bee Team move to stop him from absorbing all seven Mini-Cons.